Tickets are $20 for a one day pass and $40 for a 3-day pass and will be available online as of August 1, 2003. Cover scan by Tom Smith, photograph from Comics Continuum. I volunteered at the Actor booth for the entire weekend. Comic book veteran George Perez came by frequently to hang out. "These events are like live versions of what we do in the magazine every month," said (Gareb) Shamus, who publishes Wizard: The Comics Magazine. "It's a big club; everybody's invited." That includes Perez, who says he's delighted at the opportunity to meet fans. Perez was a poor kid from a Puerto Rican family. His folks encouraged him to read comics to improve his English. "I would read as much as I could on my allowance," he says. He then began creating his own artwork. "To be living a child's dream is still a wonder to me." Now, original Perez works can fetch up to $10,000 each. Fans won't have to spend that kind of money to get figurines representing their comic heroes at Wizard World Texas, but merchandisers will provide plenty of opportunities. 11-24-03: COURT JESTER TAKES OVER TEXAS!!!! During the "JLA/Avengers" Q+A at Wizard World Texas this weekend, writer Kurt Busiek jokingly referred to himself and legendary artist George Perez as "the sickliest team in comics." That's not far from the truth: Busiek is still recovering from a much-publicized case of mercury poisoning, and Perez spent the weekend sporting a wrist brace for his tendonitis. Nevertheless, their respective ailments don't seem to have slowed them down any. Both Busiek and Perez did multiple signings, and Perez turned up Friday and Saturday mornings to sign autographs for the fans queued up around the outside of the convention center. Saturday afternoon, the dynamic duo got together to talk about their twenty-years-in-the-making "JLA/Avengers" collaboration and about the lessons of craft they've learned over the years. Things kicked off when Busiek was asked if he regretted Mark Waid having to drop out of the project. "Hell no, I get all the money! I tend to think that if me and George are working to put our ideas onto the page, it will be stronger than if it were me and George and Mark. The vision is purer that way." Pure visions aside, both creators admitted to some good-natured butting of heads while working on the project. "The Captain American versus Batman fight was one of the few fights that actually had some kind of resolution in the original 'JLA/Avengers,' back in the eighties," said Perez. "But the challenge was, how do you draw a subtle feint? The script says, 'They barely move.' Oh, great! That's why, in the issue before, I had Thor conjure up rain, so that I could show movement. I call it my 'Lethal Weapon' sequence." On Saturday, George Perez and Kurt Busiek teamed up again in Texas for a panel. The two fielded questions from the audience about Avengers/JLA, inspirations, pet peeves, and more. After greeting the fans and discussing a few things, the attendants were able to ask Perez and Busiek questions on anything and everything. Here’s a portion of the transcript of the Q and A session. QUESTION: Were there any Avengers stories that you didn't get to do that you wanted to do together? GEORGE PEREZ: Marv Wolfman, when we worked together on Titans, set the bar very high on collaboration. Working with Kurt was very much like working with Marv on Titans. BUSIEK: Bouncing off each others' ideas is what makes collaboration rich. If you agree on everything right from the start, well, where's the interaction, where's the fun, you don't find anything new outta that. The morning began with tremendous crowds lining the hallways and even spilling out onto the streets of the Arlington Convention Center, waiting to be the first ones in. Guest of Honor George Perez even helped crowd control, signing autographs up and down the line for everyone waiting. Upon entering the convention floor the crowds were noticably impressed with all the signings and events lined up including the Jim Lee signing at the DC booth, Marc Silvestri and Paul Jenkins at the Top Cow booth and Joe Quesada at the ACTOR booth. But the most overwhelming buzz was over two of Hollywood's most notable directors - Guillermo Del Toro, the director of Blade and the upcoming Hellboy movie, and Kevin Smith director of such fan-fave flicks such as Clerks and Mallrats along with his cohort Jason mewes (Jay and Bob Strikes Back ) - and their Q&A panels being held later in the day. 11-21-2003 06:59 PM by MattBrady At today’s DC panel at WizardWorld Texas, the publisher showed up with a slate full of announcements – some cementing previously hinted at projects, and some coming out of the blue. Newsarama’s got ya covered for a quick run down of what’s coming, and what will raise eyebrows. Completing George Perez’s duo of flashback projects, DC will publish his and Marv Wolfman’s New Teen Titans Graphic Novel which originally began production in 1988. Perez had over 70 of the pages draw before the plug was pulled, and the final page count of the GN should run in the 120 page range. Set in the era of the “classic” Wolfman/Perez Titans, the OGN will include a new framing sequence by Wolfman and Perez that will allow the story to stand in current continuity. The Teen Titans story 17 years in the making finally heads to a comic book shop near you. The classic New Teen Titans creative team of Marv Wolfman and George Perez have reteamed to finish their original graphic novel Teen Titans: Games as announced moments ago at Wizardworld Texas. 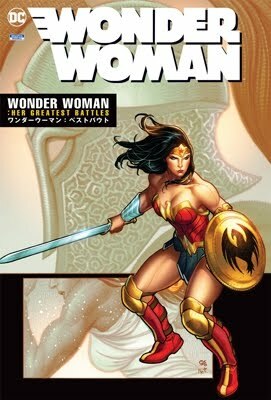 Originally started back in 1987, DC plans to release the long-awaited story as a hardcover in late 2004 or early 2005. With 73 pages already completed by Perez, Teen Titans: Games was put on hold due to Perez's busy schedule, and nearly two decades passed by before it was finally revived in late 2003. With the current Geoff Johns/Mike McKone series selling like crazy and a popular Cartoon Network animated series to boot, the time was ripe for Games to finally see the light of day. "For the past fifteen years I've tried to push every Titans editor to revive the project," revealed Wolfman. "At the time we worked it out with then editor Barbara Kesel, both George and I felt it may have been the best Titans story we'd ever come up with. And George had done over 70 of the absolute best Titans pages he'd ever drawn, and I thought it a crime not to publish them. But DC never wanted to unless George finished them himself." For those of you not deep in the heart of Texas, no worries. We have information on all the projects from DC COMICS. At their panel, the publisher revealed some big plans involving some of comics top creators. Chuck Dixon is going to be writing for the imprint again on a Richard Dragon series with Scott McDaniel. The much anticipated sixteen year old New Teen Titans graphic novel that was half complete by Marv Wolfman and George Perez is finally going to be released. Plus DC talked about its Focus line, new First Appearance action figures, and several new series, including the return of Wetworks. When people learned that the George Perez/Marv Wolfman New Teen Titans graphic novel from 1987 was not going to be completed due to Perez suffering a creative block, some Titans fans were crushed. Off and on through the years, Wolfman and Perez would mention the unfinished project, never going into too many details, but always with the sentiment hoping it would be finished someday. That day appears to be December 2004. The graphic novel features the original New Teen Titans team as well as Jericho and Danny Chase. George Perez, Dan Di Dio, Kurt Busiek, Paul Dini, Jim Lee, Tom Raney, Mike Turner, Talent Caldwell, were guests on a Bob Wayne moderated panel today at Wizard World Texas. Along with the other DC News PULSE is already reporting, several other projects were mentioned, including a SANDMAN related one, and further details about some of the properties already reported upon were released. Michael Turner, Carlos Pacheco, Frank Miller, Joe Kelly, and several others are all knee deep in DC projects. ON the New Teen Titans graphic novel, artist George Perez commented, “This is a story fifteen years in the making.” He told attendants that one collector had all the pages he’d drawn so far, but that he gave them to Perez for use in this project. The graphic novel was drawn well before the World Trade Center collapsed, but DC decided not to have the pages that feature the WTC redrawn. DC is considering this to be an “untold tale.” As reported the GN features Troia, Starfire, Changeling, Cyborg, Danny Chase, Raven, Nightwing, and Jericho. Perez also commented on the reason JLA/Avengers was late was due to a hand injury. Marv Wolfman is excited about his new upcoming project, according to TODAY'S VIEWS (11/18/03). Although he did not name what it was, he did mention that the project will be announced at WIZARDWORLD TEXAS 2003. We all know what it is, but please act surprise. Writer Kurt Busiek and artist par excellance George Perez take you behind the scenes of the most awaited comics event since...well, ever! From November 21 through 23, members of the DC Comics staff and freelance community will be in Arlington, TX, for Wizard World Texas. JOIN THE PARTY AT WIZARD WORLD TEXAS! Test your comic trivia and win a free pass to Wizard World Texas and more! Think you know a lot about comic trivia? Now is your chance to prove it to us! Take our comic trivia quiz for a chance to win a 3-day pass to the biggest pop culture event to hit the Lone Star state, Wizard World Texas – Nov. 21-23 at the Arlington Convention Center. Ten lucky winners will receive a prize pack containing: a 3-day ticket to Wizard World Texas ’03 and an official Wizard World Texas convention T-shirt.